Some wonderful covers in this latest issue of Analyst. The colourful outside front cover comes from Jacob Filik at Diamond Light Source Ltd., UK, who together with colleagues from the UK have prepared a study that demonstrates the use of standard morphological image processing techniques to reduce the hyperspectral image data of samples, containing discrete particles or domains, to a single average spectrum per particle. The informative inside front cover comes from a team of scientists from Japan. Masaya Miyazaki from the National Institute of Advanced Industrial Science and Technology and colleagues has been imaging protein crystals deposited on a nanodroplet through the use of Raman spectroscopy. Acquiring a high quality protein crystal is important to be able to determine its structure. This is often the first step in novel drug design. These papers will be free to read for 6 weeks. 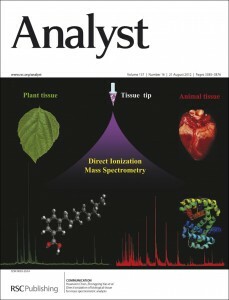 We enter the world of forensics for the outside front cover for this most recent issue of Analyst. Frederic Zenhausern and colleagues from the University of Arizona, USA, report on a prototype of a PCR on a plastic mircofluidic device. From Homanaz Ghafari and Quentin S. Hanley at Nottingham Trent University, UK, comes our inside front cover. This paper reports on optically sectioned planar format assays detected using quantum dot (QD) reporters arrayed along the optical z-axis on mica or glass substrates to form volume encoded arrays. 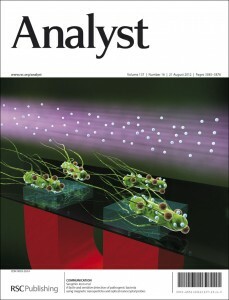 Analyst Issue 22 now online! 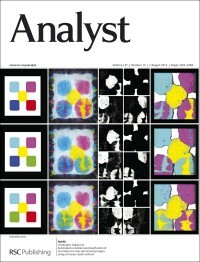 The latest issue of Analyst has now gone online, so take a look at the wonderful covers and the work that inspired them! On the front cover we have an image from Editorial Board member Boris Mizaikoff, Christine Kranz and colleagues from the University of Ulm. Their group designed a miniaturized cell stretching device for mechanically stimulating living cells at physiologically relevant levels applicable to a wide variety of adherent cell types. Click on the link below to read more. Our inside front cover comes from Pak Kin Wong, The University of Arizona, USA, who together with colleagues reports on a hybrid electrokinetic technique that can manipulate mammalian cells in physiological fluids. Cells can be adjusted for separation and focusing applications. Click below to find out more. On the back cover, we showcase research feature from the Sherif A. El-Safty Laboratory, National Institute for Materials Science, Japan. Uniform, 3D mesopore, ordered monoliths lead to tailored mesocaptor design of heavy metals. A multi-capture system enabled optical separation, and detection of ultra-trace level of ions in drinking water. This captor would develop a simple technique for wastewater treatment and management. All of these cover articles will be free to read for 6 weeks. 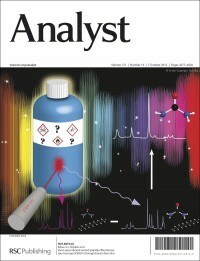 Analyst Issue 21 now online! 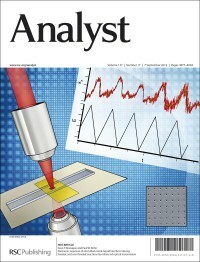 The latest issue of Analyst is online with three cover articles for you to enjoy. The very informative front cover comes from Yu-Chang Tyan and Tze-Wen Chung from the National Yunlin University of Science and Technology and Kaohsiung Medical University, respectively, and colleagues from Taiwan. In their study they proposed a new approach for the detection of proteins to assess the response of fibroblasts to a material surface. Biomaterials play an important role in regenerative medicine and drug delivery, therefore the interactions between biomaterial surfaces and cells are important to characterize cell proliferation, differentiation and regeneration of tissues. We head to Canada for our inside front cover. Kathleen M. Gough and Susan G. W. Kaminskyj from the University of Manitoba and the University of Saskatchewan, together with colleagues have been studying the filamentous fungi Aspergillus. This fungi can can affect humans through their roles in biotechnology and recycling, and can also be responsible for disease. What they have discovered is that Surface Enhanced Raman Scattering (SERS) can provide chemical information on materials that are in close contact with appropriate metal substrates, in this case nanopatterned gold surfaces and gold nanoparticles (AuNPs). They have created conditions for AuNP formation within and on the surface of Aspergillus nidulans hyphae in order to explore their potential for SERS analysis. 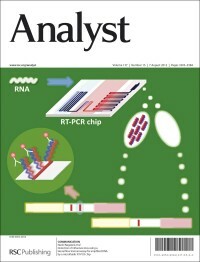 On the back cover of this month’s issue we showcase the work contributed by Weidong He, and Xiao Lin at the Vanderbilt Institute of Nanoscale Science and Technology, and the Institute of Physics, Chinese Academy of Sciences who together with colleagues have studied the analytical expression of Coulombic interaction between a nanorod and a nanoparticle. All of these papers will be free to access for 6 weeks. So why not click through and have a read. 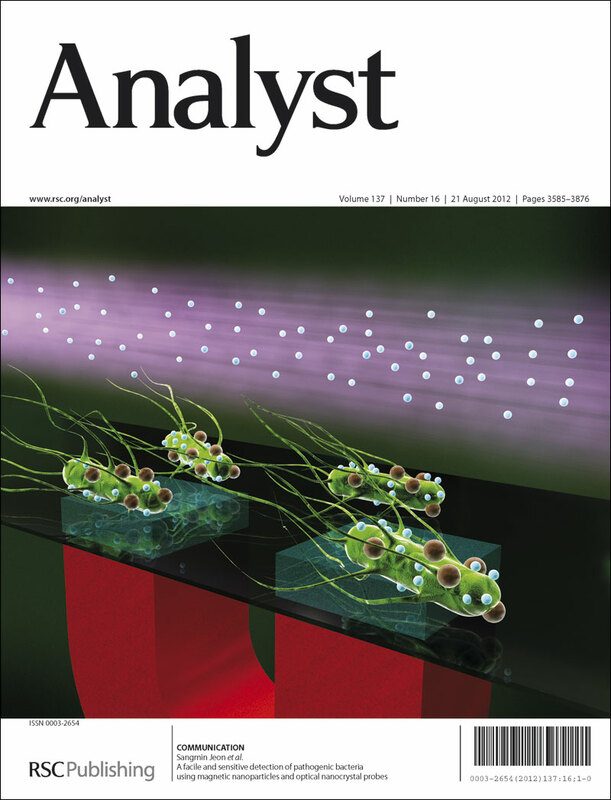 The latest issue of Analyst is online, with three cover articles for you to enjoy. Our stunning front cover comes from the groups of Professor Robin Turner and Professor Michael Blades at the University of British Columbia, Vancouver, Canada. Their study establishes the utility of Raman spectroscopy to non-invasively detect biologically relevant changes in live cells exposed to conditions known to trigger autophagy. The centre image is a differential interference contrast image of two MCF-7 cells, a human breast cancer cell line, after being starved of glutamine for two days. The surrounding four images are chemical maps based on Raman microspectroscopy of the same two cells rendered from chemically-selective band intensities that indicate the spatial distributions of DNA and RNA (upper-left); RNA only (upper-right); phospholipid (lower-left) mapped relative to nucleic acid; and hydroxyapatite (lower-right), which is a common marker for breast cancers and strongly associated with malignancy. In each image, the red intensity indicates the highest concentration, blue the lowest. The advantage of this type of chemical imaging, according to the authors, is that it is non-destructive and label-free. 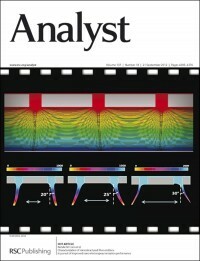 On the inside front cover, Dr Michael Hippler and colleagues from Sheffield University, UK, introduce a variant of cavity-enhanced Raman spectroscopy (CERS) in which diode laser radiation at 635 nm is coupled into an external linear optical cavity composed of two highly reflective mirrors. Using optical feedback stabilisation, build-up of circulating laser power by three orders of magnitude occurs. Strong Raman signals are collected in forward scattering geometry. 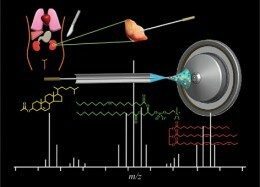 The authors say CERS has the potential to become a new standard method to monitor Raman active species, in particular important homonuclear gases like nitrogen, oxygen or hydrogen that can not be easily detected by alternative spectroscopic techniques. The image on the back cover is from Mridul Kanti Mandal and Kenzo Hiraoka of University of Yamanashi, Chuo, Japan, and their co-workers. They have developed a method to perform remote and direct sampling for mass spectrometry. They say that the method is easy to operate and versatile allowing any biological specimen to be sampled away from the instrument in a minimally invasive manner. All these cover articles will be free to access until the end of October, and don’t forget to also take a look at this issue’s HOT articles. The latest issue of Analyst has landed, and as usual there are some interesting cover images and articles for you to enjoy. On the front cover is a Communication from Rebecca Hopkins and colleagues from DSTL Porton Down, UK. They demonstrate spatially offset Raman spectroscopy (SORS) using 1064 nm excitation to detect chemicals through a physical barrier such as a container. This excitation wavelength overcomes the issue of fluorescence from the target chemical, whilst retaining the benefits of the SORS technique for through-barrier detection. The authors say these advantages have a wide range of applications in both civilian and military environments. The inside front cover features a Critical Review from Guido Verbeck and colleagues from the University of North Texas. Their review concentrates on the apparatus and techniques associated with deposition processes, and covers the hyperthermal and thermal energetic regimes which allow for species to be landed intact. Both these cover articles will be free to access for 6 weeks, and don’t forget to take a look at the HOT Articles featured in Issue 19 too. Our latest issue is now available, so do take a look. 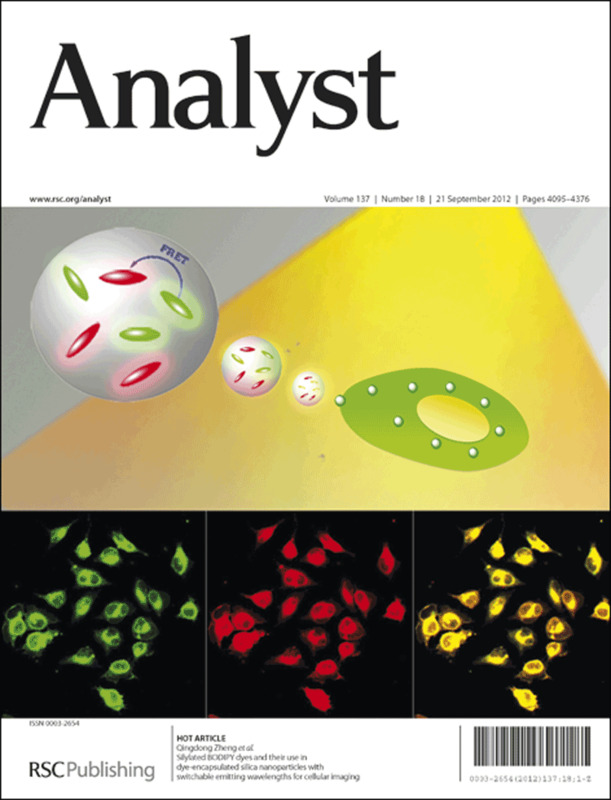 Featured on the front cover, Qingdong Zheng from the Fujian Institute of Research on the Structure of Matter, Fuzhou, China, and co-workers, report on the synthesis and characterization of two silylated BODIPY dyes and their use in dye-encapsulated silica nanoparticles with switchable emitting wavelengths for cellular imaging. In order to realise multiplexed imaging, they doped two different dyes into the same nanoparticle, which is able to emit light with different colors based on a change in excitation wavelengths. On the inside front cover, Natalie Cann and colleagues from Queen’s University, Kingston, Canada present full-dimensional computational fluid dynamics (CFD) simulations for nano electrospray ionization (ESI) with various emitter designs as a step towards an integrated approach to emitter design and characterization. Both these articles will be free to access for 6 weeks. Don’t forget to see which HOT articles also feature in this issue. 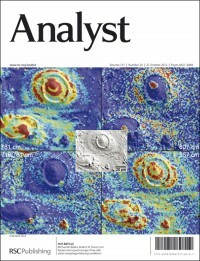 Take a look at the latest issue of Analyst, with two great covers and host of HOT articles for you to enjoy. The front cover features a HOT paper from our Editorial Board Chair, Paul Bohn, and his post-doc Sean Branagan. Paul and Sean demonstrate electrochemical imaging using enhanced optical transmission (EC-EOT) by applying it to several categories of electrochemical processes, using a spectral mapping technique that can be miniaturized. They say that in future applications, the enhanced spectral information offered by EOT may be useful for separating faradaic- and non-faradaic electrochemical signals as well as spatially resolving phenomena occurring at different locations relative to the electrified interface. In this issue of Analyst we have two lovely covers for you to admire. On the outside we have an image from Sangmin Jeon and colleagues from Pohang University of Science and Technology, Korea. In their paper they report a new way of detecting Salmonella bacteria, a common cause of food poisoning. This simple, rapid, and cost-effective method used magnetic (superparamagnetic) nanoparticles and TiO2 nanocrystals. From Zhong-Ping Yao at The Hong Kong Polytechnic University, China, comes the inside front cover. Together with a team from around China, they have been analyzing biological tissue at the molecular level. They have been able to directly ionize and analyze both plant and animal tissue by mass spectrometry under ambient conditions. These cover articles will be free to access for 6 weeks, so click through and have a read. 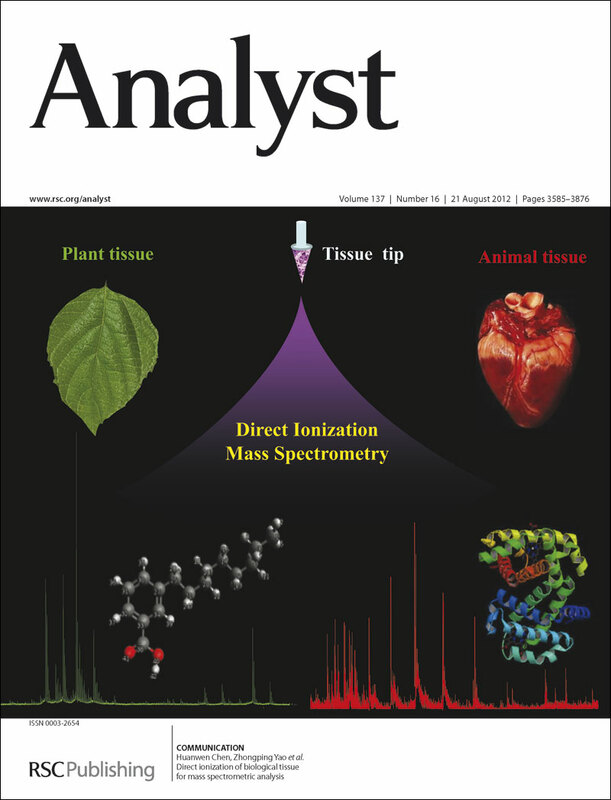 In the latest issue of Analyst, the front cover features work from Eiichi Tamiya of Osaka University, Japan, and co-workers. They have detected the influenza virus using an amplified DNA detection lateral flow immunoassay (ADLFIA). The sensitivity of their method is comparable to agarose gel electrophoresis but can be observed by the naked eye. The authors say this work is a step forward in their efforts towards a battery powered portable PCR chip, and a battery powered portable PCR chip with ADLFIA has the potential to give the portable system a diagnostic test. 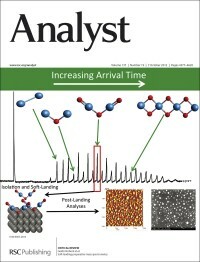 On the inside front cover Christopher Szakal and colleagues at NIST, USA who present a novel method for correlating and classifying ion-specific time-of-flight secondary ion mass spectrometry (ToF-SIMS) images within a multispectral dataset by grouping images with similar pixel intensity distributions. They say that this algorithm should extend well into three-dimensional datasets, allowing for classification of chemical species as a function of depth into a sample. Both these cover articles are free to access for 6 weeks. 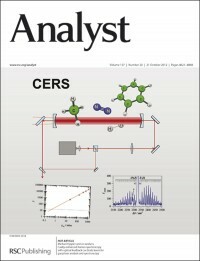 Don’t forget to take a look at this issue’s HOT articles too, featuring the use of ligand–receptor interactions in 13C MRI, metal–organic framework MIL-101(Cr) microcrystals for rapid magnetic solid-phase extraction, odorant biosensors, SR-FTIR micro-imaging of latent fingerprints, a new fluorescent and colorimetric Cu2+ probe, and an efficient fluorescent probe mimicking multiple logic gates and a molecular-keypad lock. You are currently browsing the archives for the Covers 2012 category.